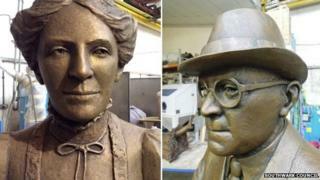 Two new statues have been unveiled of a doctor and his wife who championed free health care in south London, three years after an original was stolen. Alfred and Ada Salter helped regenerate Bermondsey's slums and planted 9,000 trees in parks, playgrounds and churchyards in the early 1900s. The original statue of Dr Alfred Salter was stolen from Bermondsey in 2011. A newly commissioned statue of his wife, Ada, who was London's first female mayor, was also unveiled. Artist Diane Gorvin, who created the original statue of Dr Salter in 1991, was commissioned two create the new Salter statues. Johanna Crawshaw, the grand-niece of Dr Salter said: "On behalf of my family, I would like to thank and congratulate everyone who has given their time and energy to replace and enhance these impressive statues." The Salter Statues Campaign group raised £60,000 which Southwark Council matched to pay for the statues.